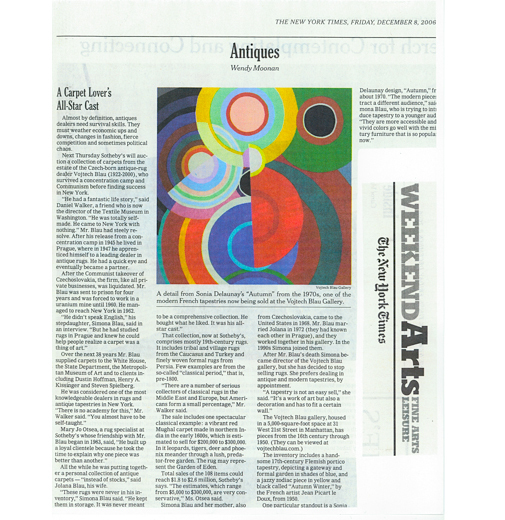 The Vojtech Blau Inc. collection was featured in the article, “A Carpet Lover’s All-Start Cast,” by Wendy Moonan in the Weekend Arts section of the New York Times. Mrs. Moonan’s article explores the “fantastic life story” of Vojtech Blau, the late antique rug dealer who founded the company his daughter, Simona Blau, now currently directs. The article also highlights the Sotheby’s sale of a part of the extensive rug collection Mr. Blau built during his lifetime, and the refinement of the company as experts in the field of antique and modern tapestries under Simona Blau’s supervision.